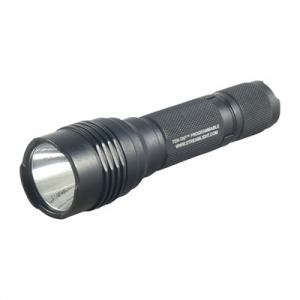 Compact, ultra-lightweight hand-held light packs powerful C4 LED technology to deliver a super-bright 120 lumen (4,800 candlepower) beam. Features a rugged, high-impact polymer body, with deep grasping grooves for a non-slip grip. O-ring seals make the light waterproof down to 1 meter for 30 mins. The LED lamp is far more resistant to shock than traditional filament lamps, and has a 50,000 hour lifetime expectancy. Push-button switch in the tailcap provides one-handed momentary or constant-on operation. Rotate the cap to "lockout" off position to prevent accidental activation and battery run down. Three hours of continuous runtime on two batteries. Mfg: Streamlight SPECS: Reinforced nylon polymer, Black or Coyote. 5 1/4" (13.3cm) long, 1" (2.5cm) O.D. 4.1 oz. (116g) wt. Two CR-123A lithium-ion batteries included.